BNL is staffed by approximately 2,750 scientists, engineers, technicians, and support personnel, and hosts 4,000 guest investigators every year. The laboratory has its own police station, fire department, and ZIP code (11973). In total, the lab spans a 5,265-acre (21 km2) area that is mostly coterminous with the hamlet of Upton, New York. BNL is served by a rail spur operated as-needed by the New York and Atlantic Railway. Co-located with the laboratory is the Upton, New York, forecast office of the National Weather Service. Brookhaven National Lab was originally owned by the Atomic Energy Commission and is now owned by that agency's successor, the United States Department of Energy (DOE). DOE subcontracts the research and operation to universities and research organizations. It is currently operated by Brookhaven Science Associates LLC, which is an equal partnership of Stony Brook University and Battelle Memorial Institute. From 1947 to 1998, it was operated by Associated Universities, Inc. (AUI), but AUI lost its contract in the wake of two incidents: a 1994 fire at the facility's high-beam flux reactor that exposed several workers to radiation and reports in 1997 of a tritium leak into the groundwater of the Long Island Central Pine Barrens on which the facility sits. Following World War II, the US Atomic Energy Commission was created to support government-sponsored peacetime research on atomic energy. The effort to build a nuclear reactor in the American northeast was fostered largely by physicists Isidor Isaac Rabi and Norman Foster Ramsey Jr., who during the war witnessed many of their colleagues at Columbia University leave for new remote research sites following the departure of the Manhattan Project from its campus. 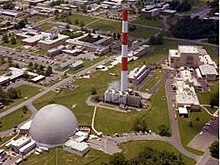 Their effort to house this reactor near New York City was rivalled by a similar effort at the Massachusetts Institute of Technology to have a facility near Boston. 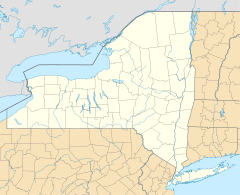 Involvement was quickly solicited from representatives of northeastern universities to the south and west of New York City such that this city would be at their geographic center. In March 1946 a nonprofit corporation was established that consisted of representatives from nine major research universities — Columbia, Cornell, Harvard, Johns Hopkins, MIT, Princeton, University of Pennsylvania, University of Rochester, and Yale University. Out of 17 considered sites in the Boston-Washington corridor, Camp Upton on Long Island was eventually chosen as the most suitable in consideration of space, transportation, and availability. The camp had been a training center from the US Army during both World War I and World War II. After the latter war, Camp Upton was deemed no longer necessary and became available for reuse. A plan was conceived to convert the military camp into a research facility. In 1947 construction began on the first nuclear reactor at Brookhaven, the Brookhaven Graphite Research Reactor. This reactor, which opened in 1950, was the first reactor to be constructed in the United States after World War II. The High Flux Beam Reactor operated from 1965 to 1999. In 1959 Brookhaven built the first US reactor specifically tailored to medical research, the Brookhaven Medical Research Reactor, which operated until 2000. In 1952 Brookhaven began using its first particle accelerator, the Cosmotron. At the time the Cosmotron was the world's highest energy accelerator, being the first to impart more than 1 GeV of energy to a particle. The Cosmotron was retired in 1966, after it was superseded in 1960 by the new Alternating Gradient Synchrotron (AGS). The AGS was used in research that resulted in 3 Nobel prizes, including the discovery of the muon neutrino, the charm quark, and CP violation. In 1970 in BNL started the ISABELLE project to develop and build two proton intersecting storage rings. The groundbreaking for the project was in October 1978. In 1981, with the tunnel for the accelerator already excavated, problems with the superconducting magnets needed for the ISABELLE accelerator brought the project to a halt, and the project was eventually cancelled in 1983. The National Synchrotron Light Source operated from 1982 to 2014 and was involved with two Nobel Prize-winning discoveries. It has since been replaced by the National Synchrotron Light Source II. After ISABELLE'S cancellation, physicist at BNL proposed that the excavated tunnel and parts of the magnet assembly be used in another accelerator. In 1984 the first proposal for the accelerator now known as the Relativistic Heavy Ion Collider (RHIC) was put forward. The construction got funded in 1991and RHIC has been operational since 2000. One of the world's only two operating heavy-ion colliders, RHIC is as of 2010 the second-highest-energy collider after the Large Hadron Collider. RHIC is housed in a tunnel 2.4 miles (3.9 km) long and is visible from space. In 1958, Brookhaven scientists created one of the world's first video games, Tennis for Two. In 1968 Brookhaven scientists patented Maglev, a transportation technology that utilizes magnetic levitation. Relativistic Heavy Ion Collider (RHIC), which was designed to research quark–gluon plasma and the sources of proton spin. Until 2009 it was the world's most powerful heavy ion collider. It is the only collider of spin-polarized protons. Center for Functional Nanomaterials (CFN), used for the study of nanoscale materials. National Synchrotron Light Source II (NSLS-II), Brookhaven's newest user facility, opened in 2015 to replace the National Synchrotron Light Source (NSLS), which had operated for 30 years. NSLS was involved in the work that won the 2003 and 2009 Nobel Prize in Chemistry. Computational Science resources, including access to a massively parallel Blue Gene series supercomputer that is among the fastest in the world for scientific research, run jointly by Brookhaven National Laboratory and Stony Brook University. Interdisciplinary Science Building, with unique laboratories for studying high-temperature superconductors and other materials important for addressing energy challenges. NASA Space Radiation Laboratory, where scientists use beams of ions to simulate cosmic rays and assess the risks of space radiation to human space travelers and equipment. Brookhaven was also responsible for the design of the SNS accumulator ring in partnership with Spallation Neutron Source in Oak Ridge, Tennessee. Brookhaven plays a role in a range of neutrino research projects around the world, including the Daya Bay Reactor Neutrino Experiment in China and the Deep Underground Neutrino Experiment at Fermi National Accelerator Laboratory. For other than approved Public Events, the Laboratory is closed to the general public. The lab is open to the public on several Sundays during the summer for tours and special programs. The public access program is referred to as 'Summer Sundays' and takes place on four Sundays from mid-July to mid-August, and features a science show and a tour of the lab's major facilities. The laboratory also hosts science fairs, science bowls, and robotics competitions for local schools, and lectures, concerts, and scientific talks for the local community. The Lab estimates that each year it enhances the science education of roughly 35,000 kindergarten to 12th grade LI students, more than 200 undergraduates, and 550 teachers from across the United States. Since 1993, DOE has spent more than US$580 million on remediating soil and groundwater contamination at the lab site and completed several high-profile projects. These include the decommissioning and decontamination of the Brookhaven Graphite Research Reactor, removal of mercury-contaminated sediment from the Peconic River, and installation and operation of 16 on- and off-site groundwater treatment systems that have cleaned more than 25 billion gallons of groundwater since 1996. Shortly after winning the contract to operate the lab in 1997, BSA formed a Community Advisory Council (CAC) to advise the laboratory director on cleanup projects and other items of interest to the community. The CAC represents a diverse range of interests and values of individuals and groups who are interested in or affected by the actions of the Laboratory. It consists of representatives from 26 local business, civic, education, environment, employee, government, and health organizations. The CAC sets its own agenda, brings forth issues important to the community, and works to provide consensus recommendations to Laboratory management. ^ "Nobel Prizes at BNL". Bnl.gov. Retrieved July 25, 2012. ^ "About BNL". BNL.gov. Retrieved June 21, 2016. ^ "NWS Forecast Office New York, NY". September 5, 2017. ^ "Physics Department". Bnl.gov. May 12, 2008. Retrieved March 17, 2010. ^ "Homepage, Basic Energy Sciences Directorate". Bnl.gov. Archived from the original on May 27, 2010. Retrieved March 17, 2010. ^ "Environmental Sciences Department". Bnl.gov. February 4, 2009. Archived from the original on March 8, 2010. Retrieved March 17, 2010. ^ "Brookhaven National Laboratory Nonproliferation and National Security Programs". Bnl.gov. February 2, 2010. Retrieved March 17, 2010. ^ "Biology Department – Brookhaven National Laboratory". Biology.bnl.gov. Archived from the original on March 13, 2009. Retrieved March 17, 2010. ^ "BNL | Accelerator-based Science". www.bnl.gov. ^ Crease, Robert P. (1999). Making Physics: A Biography of Brookhaven National Laboratory. ^ "RHIC | Relativistic Heavy Ion Collider". Bnl.gov. Retrieved March 17, 2010. ^ "RHIC | Spin Physics". www.bnl.gov. Retrieved August 23, 2016. ^ "Center for Functional Nanomaterials, Brookhaven National Laboratory". Bnl.gov. Retrieved March 17, 2010. ^ "National Synchrotron Light Source". Nsls.bnl.gov. Archived from the original on March 15, 2010. Retrieved March 17, 2010. ^ a b "Nobel Prize | 2003 Chemistry Prize, Roderick MacKinnon". Bnl.gov. Retrieved March 17, 2010. ^ "Alternating Gradient Synchrotron". Bnl.gov. January 31, 2008. Retrieved March 17, 2010. ^ "Accelerator Test Facility". Bnl.gov. January 31, 2008. Archived from the original on May 27, 2010. Retrieved March 17, 2010. ^ "Tandem Van de Graaff". Bnl.gov. February 28, 2008. Archived from the original on February 19, 2010. Retrieved March 17, 2010. ^ "BNL Newsroom | Doors Open at New Interdisciplinary Science Building for Energy Research at Brookhaven Lab". www.bnl.gov. Retrieved August 23, 2016. ^ "BNL | NASA Space Radiation Laboratory (NSRL)". www.bnl.gov. Retrieved August 23, 2016. ^ "BNL | Brookhaven and the Large Hadron Collider". www.bnl.gov. Retrieved August 23, 2016. ^ "BNL | Neutrino Research History". www.bnl.gov. Retrieved August 23, 2016. ^ "BNL | Summer Sundays". www.bnl.gov. Retrieved August 23, 2016. ^ "Lab reactor fully decommissioned". Retrieved August 23, 2016. ^ "Environmental Cleanup, Brookhaven National Laboratory". www.bnl.gov. Retrieved August 23, 2016. ^ "BNL | Community Advisory Council". www.bnl.gov. Retrieved August 23, 2016. ^ "Nobel Prize | 1957 Physics Prize, Lee and Yang". Bnl.gov. Retrieved March 17, 2010. ^ "Nobel Prize | 1976 Prize in Physics, Samuel Ting". Bnl.gov. Retrieved March 17, 2010. ^ "Nobel Prize | 1980 Physics Prize, Cronin and Fitch". Bnl.gov. Retrieved March 17, 2010. ^ "Nobel Prize | 1988 Prize in Physics, Lederman, Schwartz and Steinberger". Bnl.gov. Retrieved March 17, 2010. ^ "Nobel Prize | 2002 Physics Prize, Raymond Davis jr". Bnl.gov. Retrieved March 17, 2010. ^ "Nobel Prize | 2009 Chemistry Prize, Venkatraman Ramakrishnan and Thomas A. Steitz". Bnl.gov. Retrieved May 20, 2010. ^ "The anatomy of the first video game - On the Level". MSNBC. October 23, 2008. Retrieved March 17, 2010. ^ "'+alt+'". Bnl.gov. Retrieved March 17, 2010.